Japanese Navy pilot Lt (jg) Tetsuzo Iwamoto was Japan's top scoring ace of the Second World War with 202 victories. He scored his first kills over China in February 1938 and participated in many of the major campaigns in the Pacific. He employed the same combat strategy as top Luftwaffe ace Erich Hartmann, preferring quick diving pass rather than a turning dogfight. While based at Rabaul he claimed 142 of his aerial victories against almost every type of aircraft in the allied inventory. The painting above depicts Mitsubishi A6M3 Navy Type 0 Carrier Fighter Model 32. It is probably the only glimpse many allied pilots ever saw of Iwamoto. 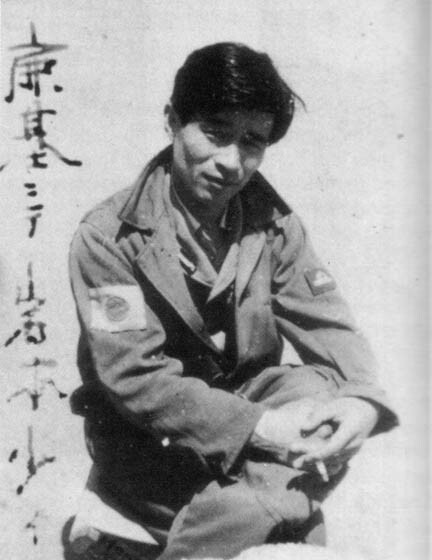 Iwamoto survived the war but died in 1955 from complications after several surgeries resulting from war wounds.